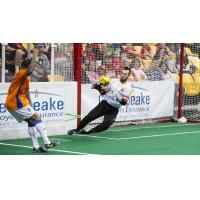 Baltimore, MD - The Blast faithful were given a fantastic send off as the Blast defeated the Metrostars 9-2. The Blast got off to a fast start when Andrew Hoxie scored his tenth goal of the season to put the Blast ahead two minutes into the game. Jonatas Melo got in on the scoring and celebrated with Andrew Hoxie by imitating their bobbleheads that were given to the fans today. Tony Donatelli scored his sixth point on the weekend with a goal from Elton de Oliveira's second assist of the game to give the Blast a 3-0 lead heading into the second quarter. The Blast would extend their lead to 4-0 as Tony Donatelli's shot careened off a Mississauga defender and past the goalkeeper. Jereme Raley would make his goal tally three in two games, as he tapped in a cross from Elton de Oliviera to give the Blast a 5-0 lead. Tony Donatelli grabbed his hat-trick with seconds remaining as the Blast entered halftime with a 6-0 lead. William Vanzela made several great saves to add on top of his impressive weekend total, including a diving save to deny a shot headed into the top corner. Damion Graham would put Mississauga on the board late in the third quarter, as he was on the right end of a Vanzela sprawling save. Vini Dantas would strike back with his team-leading twenty-second goal of the season to put the Blast back up 7-1 heading into the fourth quarter. The Metrostars would counter thirteen seconds into the fourth quarter, with Darren Chamber's sixth goal of the season. One minute later, Andrew Hoxie recorded his second goal of the afternoon, soon followed by Vini Dantas' second goal of the game to give the Blast a 9-2 lead. The Blast saw out the rest of the game with no more goals conceded to collect their fifteenth victory of the season. Andrew Hoxie and Tony Donatelli both tallied four points in the victory. William Vanzela collected fourteen saves in his fourteenth victory of the season. The Blast start a three game road-trip to end the regular season on Saturday March 30th at 7:05 ET against the Harrisburg Heat.